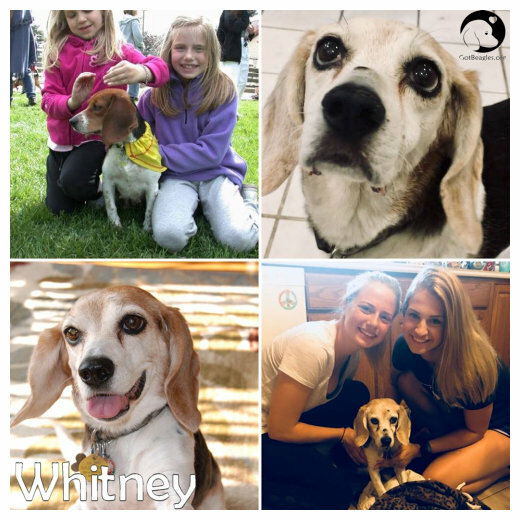 Whitney chose us at Park Ridge Beaglefest 2005. We often joked that it was because Alison’s hands smelled like the salami she had for lunch, but maybe she just thought we looked like an easy family for her to train. She turned two little girls who were previously afraid of dogs, and me-a person who had never had a dog before, into dog lovers. It was love at first sight. We knew she had to be part of our family. Once we brought her home however, we were definitely questioning that! Anyone who has ever had or known a Beagle knows what I’m talking about. Plus add to the fact as I stated previously I had never had a dog before! From our first walk where we didn’t get very far because she had to sniff EVERYTHING- to the howling in her crate because she wanted to be out. Barking at squirrels, chasing bunnies and birds, she was all hound! The squirrels really had nothing to be afraid of though. One squirrel had a bun in his mouth and when Whitney started after him, he dropped the bun and ran up a tree. Whitney then proceeded to eat the dropped bun forgetting all about the squirrel. Maybe that was her plan all along? Family parties were a treat too-she would take food out of the little kids’ hands, and jump up on tables to help herself to whatever was up there! She ate part of a chocolate cherry cake Grandma made for Morgan. One year she found where I hid the Easter jelly beans and ate that whole bag. That may be her only regret, as she paid for that dearly. (We all did, actually.) We had so many good times. We would walk the girls to and from school everyday and she was always greeted at the gate by all the kids. She loved the attention. This last year has been so hard watching her change from the spry, young dog we knew into this quieter, gentler old dog. At meal times the young Whitney would somehow always know it was time and would jump waist-high while we were scooping the food into her bowl, barking loudly the whole time. Recently I would have to remember to feed her, and there was no barking and definitely no jumping for old Whitney. We would hear young Whitney from the driveway as we were pulling in, excited to greet us. Old Whitney would still be sleeping and we had to be careful not to startle her as we came in. Young Whitney had to be leashed outside unless we wanted to chase her if she took off. Old Whitney would go where I go, not wander too far, and was always ready to come in. She was rescued from BREW Beagles from an Indiana family who’s owners were taken off to jail. That’s all we know about her first two years. From 2005 until now there’s been laughing, and walks, and barking, and yelling, and teaching her tricks, and yelling, and chewing up toys, and yelling, more barking, more walks, lots and lots of pictures. I’ll miss her sleeping on my feet and I’ll miss her sweet face. She was a very good dog who was loved very much. Thank you for choosing us. Enjoy doggie heaven Whitney, you deserve it!